Until now, nothing is known about the company itself except that it was an U.S. importer based in Fenton/New York. 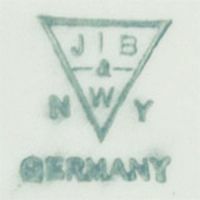 After viewing various inquiries regarding these marks and especially after receiving the information from Mr. John Hickey regarding the entry he found in Roentgen's "Marks on German, Bohemian and Austrian Porcelain" (page 633, mark №·3570) I thought it might be time to add this page anyway. 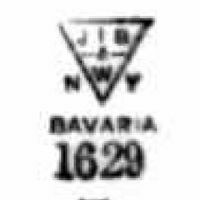 Roentgen, in various editions of his books, includes a depiction of this mark (above the country of origin reading 'Bavaria'), stating it to be [... unidentified ... possibly that of 'Jena, Bareuther & Co.', Waldsassen, Bavaria, Germany 1884-1887]. When taking a look at the different marks presented here one can easily determine that the Roentgen entry is wrong for obvious reasons. Of course the observant reader first notes that his theory completely ignores the initials 'N.Y.' and that the period he gives is also wrong as Jena, Bareuther & Co. was founded 1885 and existed in that form until 1904. But those are just minor flaws because what really matters is that this company never had a subsidiary in England or the state of Czechoslovakia, a state only founded in 1918. 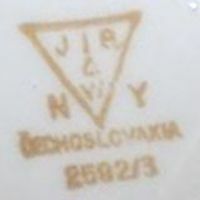 As for the Czechoslovakian version, 'ČECHOSLOVAKIA' of course can't have been used before 1918 and was from 1921 onwards replaced by 'CZECHOSLOVAKIA', so the first mark of Czechoslovakian origin shown here is older than the others. 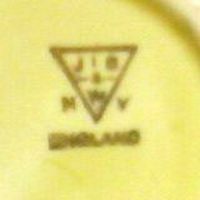 No date known, gold version stating country of origin being 'ENGLAND'. No date known, gold version stating 'GERMANY' as country of origin. 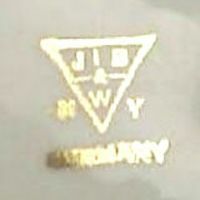 No date known, golden mark version with 'GERMANY' addition. No date known, red version with 'GERMANY' as country of origin. 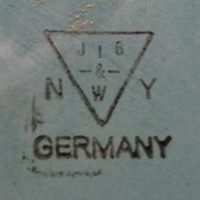 No date known, green version also stating 'GERMANY' as country of origin. 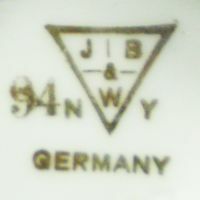 No date known, black triangular part with golden 'GERMANY' addition. 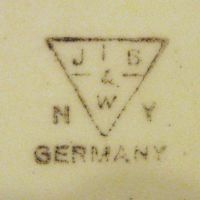 No date known, black triangular mark with 'GERMANY' addition plus mold or decoration number. 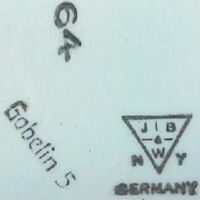 Another black mark with 'GERMANY'; interesting 'GOBELIN 5' addition normally used by Schramberg on items designed by Eva Zeisel. 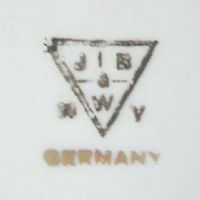 No date known, brown mark version with 'GERMANY' addition. 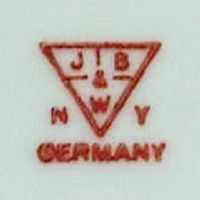 Used between 1907 and 1928. Known because the item was made by the Schmider factory from Zell (Baden-Wuerttemberg). 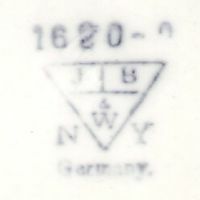 No date known, black triangular mark with 'BAVARIA' addition plus mold or decoration number. 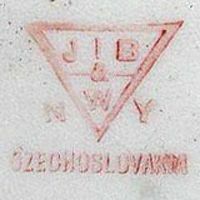 Used between 1918 and 1921 as indicated by the writing of 'ČECHOSLOVAKIA'. This version also shows some kind of mold or decoration number. Used from 1921 owards, red version with 'CZECHOSLOVAKIA'. 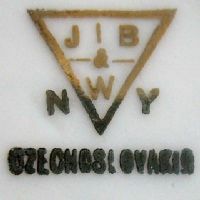 Used from 1921 owards, gold version with 'CZECHOSLOVAKIA'. 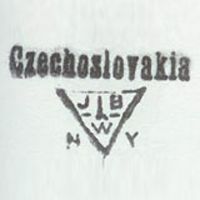 Used from 1921 owards, black version with 'CZECHOSLOVAKIA' printed above the mark.